"I'd really rather eat some liver than have a problem with my own." 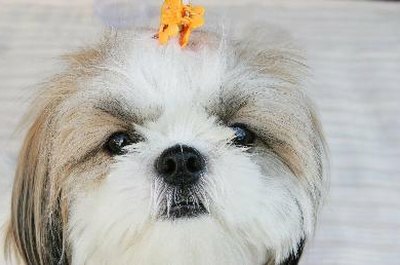 With her cheerful, loving spirit and bright, happy eyes, a Shih Tzu changes an ordinary place into a true home. But liver disease can diminish the light in those sweet eyes. Learn what to watch for and do to manage this serious condition, and keep your Tzu full of spirit. The liver is essential in maintaining health. Its many functions include filtering out toxins, making proteins and storing sugar. Most of the blood sent for these processes is from the intestines, stomach, pancreas and spleen, delivered to the liver by a vein called the portal vein. Inside the liver, the portal vein branches out into smaller and smaller vessels that send blood through the liver tissues and to each liver cell, cleaning toxins and making the proteins needed for growth and normal canine function. Liver disease is a broad label describing any problem with liver function that causes illness. A number of things can decrease liver function, such as infections, toxins, certain drugs, tumors and vascular abnormalities. While any of these could trigger liver disease in a Shih Tzu, the most common liver issues affecting the breed involve vascular defects, specifically hepatoportal microvascular dysplasia and portosystemic liver shunts -- enormous names for conditions that can cause enormous problems. But the more you know about these conditions, the more you can do to help your little "lion dog" stay healthy and full of spirit. What Is HMD and PSS? 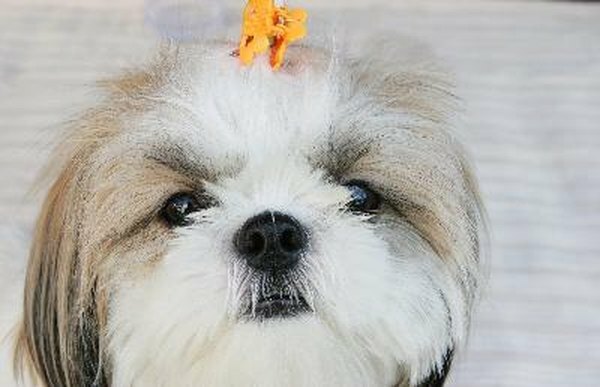 In some Shih Tzus, the microscopic vessels inside the liver that branch out from the portal vein are abnormal -- either underdeveloped or completely absent. This condition is called hepatic microvascular dysplasia (or portal atresia). Because of the reduced blood flow, the liver atrophies, or grows smaller, and is unable to perform its normal functions. A portosystemic shunt occurs when a blood vessel shunts the blood from the intestines, stomach, pancreas and spleen around the liver rather than through it, preventing the liver from doing the job it needs to do on the blood. PSS can occur either inside the liver (intrahepatic) or outside the liver (extrahepatic); it can be single or multiple, congenital (present at birth) or acquired (formed later in life). The liver shunt most commonly found in Shih Tzus is the single extrahepatic portosystemic shunt. Early-stage liver disease can be difficult to recognize because its signs are usually so vague. They include a lack of interest in food; a quiet demeanor; and persistent, occasional episodes of vomiting and, sometimes, diarrhea. A big sign of possible liver disease is a slow recovery time after anesthetics or sedatives. As the disease progresses, the symptoms grow more alarming. If the blood is bypassing the liver or if the liver isn't fully functioning, ammonia and other toxins accumulate in the bloodstream and have a poisonous effect on your little dog's brain, causing hepatic encephalopathy. It can be heartbreaking to see your once bright and lively Tzu uncoordinated, disoriented and behaving strangely -- circling mindlessly, getting stuck behind things and head-pressing (that is, bumping into a wall or object and simply standing there, pressing her head against it). Often, but not always, a blood test will show raised liver enzymes in a pup with liver disease. Special tests, such as a bile acid test, will more clearly show the extent of the liver problem, and your vet may suggest further tests such as radiology imaging or a liver biopsy. The treatment for liver disease depends on the cause. For example, a single extrahepatic portosystemic shunt -- the shunt most commonly seen in Tzus -- is often correctable with surgery. HMD, on the other hand, can't be surgically corrected, but many dogs with the condition show no symptoms. The symptoms of liver disease that can't be corrected with surgery are often managed medically, usually with the help of a special diet. Giving your pooch lactulose, a synthetic sugar, can help eliminate ammonia and other toxins from her intestines. Some veterinarians prescribe antibiotics for a short time. While many Shih Tzus with liver disease show a worsening of symptoms over time, some on medical management do very well and live normal, or nearly normal, life spans. The University of Tennessee, College of Veterinary Medicine: What Is a Portosystemic Shunt?